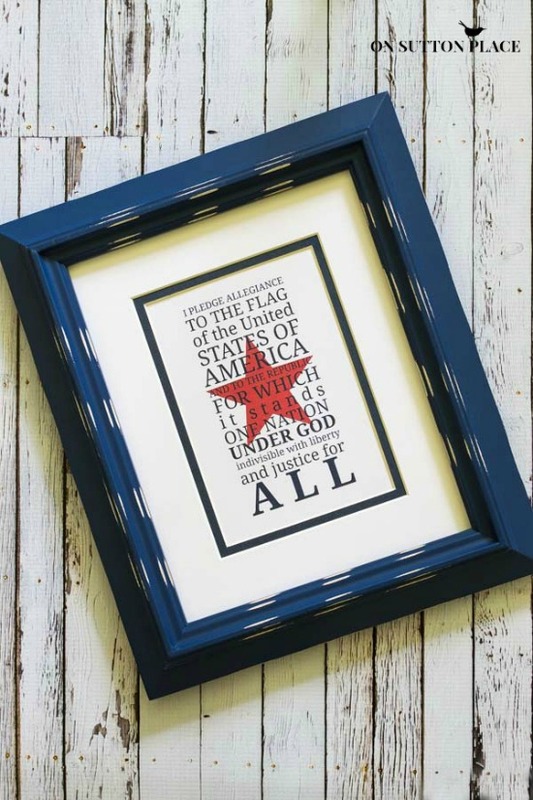 Adding patriotic touches to your decor can be simple, quick and budget-friendly. 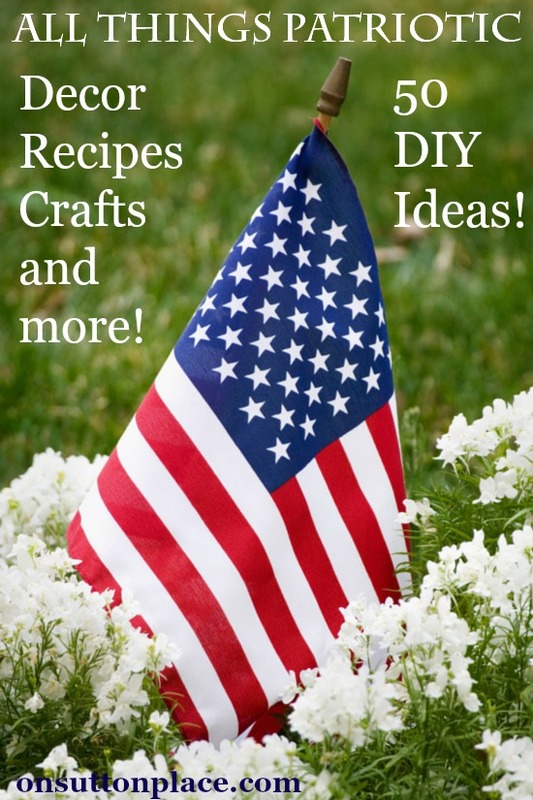 Today I’m here with some of my bHome buddies to share some patriotic ideas and DIY projects. Last year, all I did to my front door wreath was stick a couple of flags in it! 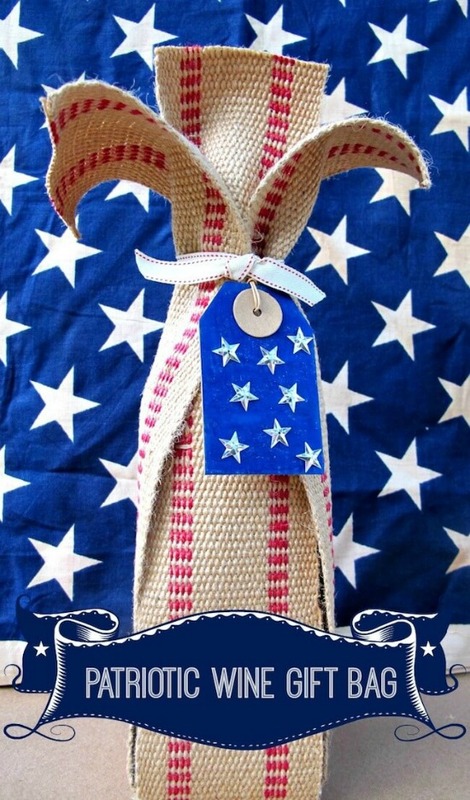 For more patriotic porch decor ideas just click the pic below or HERE. Having guests for a summer dinner party? Set the table like Shirley of Housepitality Designs. Love how Shirley incorporated sunflowers & that everyone got a goodie box. So you throw a party…it’s a huge success and friends decide to stay the night? Don’t be caught with your flags down – have your guest room decked out in patriotic flair like Kim of Savvy Southern Style! Aren’t the flags in the ironstone pitcher perfect? This is something you could do way ahead of time too. Just FYI…I am totally copying Kim’s idea for the weekend! Not hosting, but being hosted? Whip up a few webbing wine bags by Kelly of My Soulful Home. That way, you’ll have a hostess gift at the ready for all your summer socializing. If you’re not wine drinkers ~ add a bottle of estate olive oil or aged balsamic vinegar or sparkling juice. Always a welcome gift. 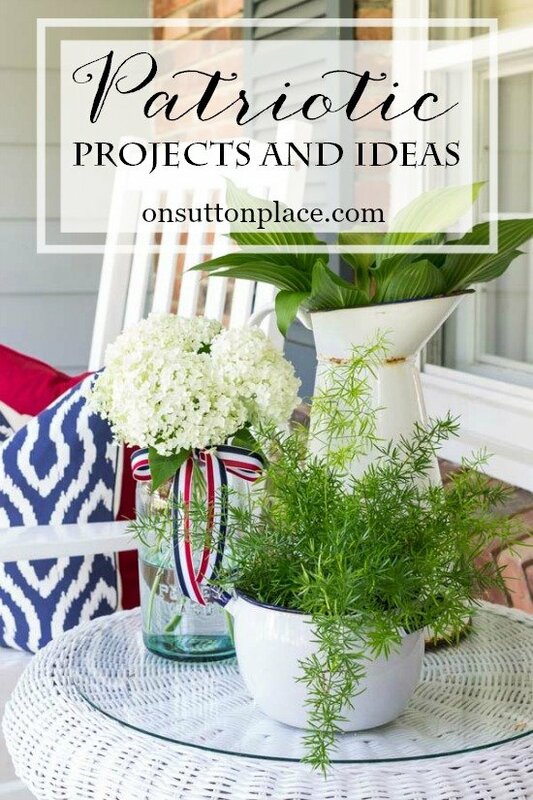 Click on thru to each of the blogs to get the tutorials, recipe & more inspiration for celebrating and decorating from Memorial day to Labor Day! What is your favorite way to celebrate in the summer? Honestly this past week has felt more like fall than summer here in Ohio! The cooler temps have enticed me to get to work in my garden so I’ll have some of that to show you soon. If you missed it I shared my Vintage Galvanized Wash Tub Herb Garden the other day. There is also a $300 Paypal Cash giveaway at the end of that post so if you haven’t entered and want to…there is still time. Click HERE. I just found you on Pintrest and clicked on your site-WOW, KUDOS TO YOU for all the amazing things you can do. I’m a beginner in almost every thing crafty or having something to do with the garden! I noticed your Climatis, it is truly gorgeous! I have one for the first time. I live in SC. We have so much humidity and I don’t know if I am going to be able to keep this one alive. I have it lightly tied to a trellis. However, I can’t figure out if I am giving it too much water or not enough- the leaves are starting to get brown but I do have a few yellow ones. In the beginning it took right off and climbed and bloomed these purple buds, but now it is not doing well! Any “Ann” advice for me? I would greatly appreciate any help or advice you would be willing to share. I can even send a pic if you want. Thank you for your time and support during this”experience. I’m sorry for the late response but this comment went into my spam…I have no idea why! 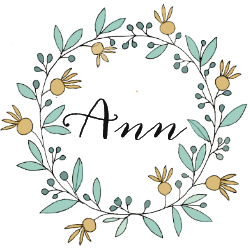 Have been following your blog for a while Ann – so many lovely ideas and inspiration. Oh my! So many beautiful photos and ideas to pin from this post! 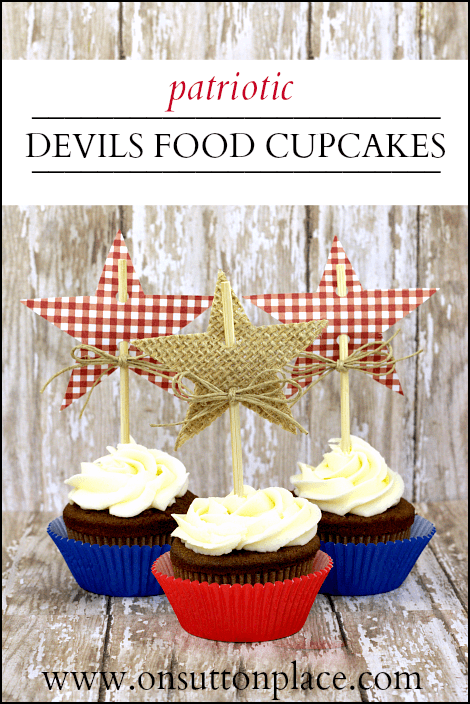 By the way, I still love your devil’s food cupcakes and toppers! Have a great weekend, Ann! Love it all Ann:) your front doors always look amazing! Have a wonderful Memorial Day weekend! Love al the ideas. Keeping it very simple this year. 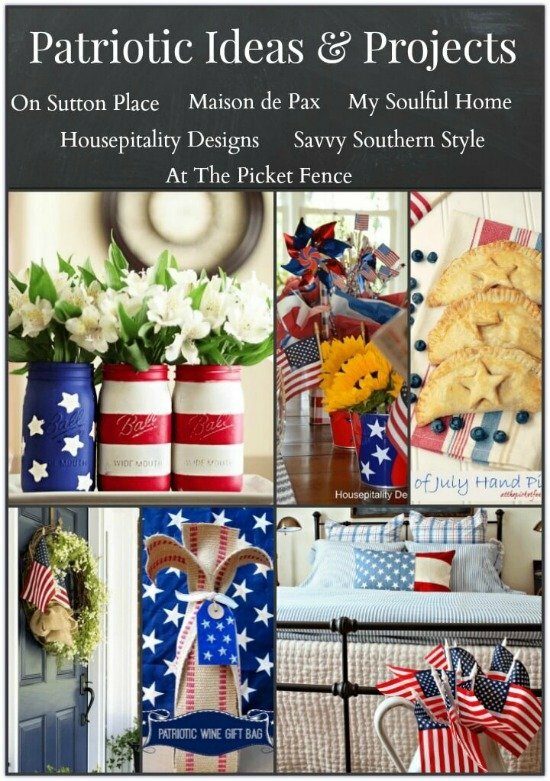 Lots of little flags in jars, pitchers, & cobalt blue vases…..to sit around the house. Of course there will be the biggest flag I could find, to hang off the porch. It’s been raining for days & days here in the west, so don’t know what to expect, & it’s hard to plan. Will try to do the mason jars…..good cure for cabin fever!! Thanks for all the great patriotic ideas! Great job! God bless all of us and the USA ! Ann….I always look forward to seeing what you create for each season…and this is one of my favorite seasons!….Beautiful porch and door decor!…so fun to be partying with you and my fellow bHome gals!…Have a wonderful Memorial Day weekend Ann!! you are great, I admire her a lot.